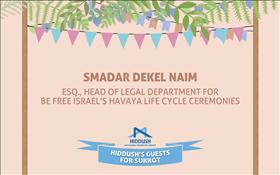 Hiddush - Sukkot 2016: Smadar Dekel Naim, Esq. Homepage / Hiddush News / Hiddush Positions / Sukkot 2016: Smadar Dekel Naim, Esq. Sukkot 2016: Smadar Dekel Naim, Esq. Smadar Dekel Naim, Esq. writes, "There is no reason whatsoever to be party to this religious coercion, especially at this most precious, family-oriented moment, and in the most personal of matters. Why should we hold non-egalitarian ceremonies, with rabbis who don't identify with our ways of life? Many of whom actually despise us?" I am a Jewish woman, and a secular woman; and I believe that my country should allow me -and every man and woman- the freedom to live Jewish lives of free will, according to our understandings and faiths, in our country. This is important for me because there are many democratic countries, but there is only one Jewish state, and this is where I live my life. I am a Jew, and I love this Land; I am connected to its culture, values, tradition, Jewish melodies, and the story of the Jewish people. In recent years, we been witnesses to a growing phenomenon of couples who "vote" with their rings, and get married in egalitarian ceremonies - without the Chief Rabbinate of Israel. Young couples ask themselves- what do we have to do with the Rabbinate? Aren't we outraged at the Rabbinate's religious monopoly in Israel? Don't we support civil marriage? Doesn't the political power of the religious political parties bother us? And they answer for themselves- there is no reason whatsoever to be party to this religious coercion, especially at this most precious, family-oriented moment, and in the most personal of matters. Why should we hold non-egalitarian ceremonies, with rabbis who don't identify with our ways of life? Many of whom actually despise us? If we oppose religious coercion, religiously motivated discrimination against women in the public sphere, inequality in sharing the civic burden, government handouts and budget line items, the dirty politics... why should we bow our heads and use the Chief Rabbinate's services, given everything it represents, when there is a better alternative? Every year thousands of couples get married without the Rabbinate in Israel at "private" wedding ceremonies, without registering their marriages with the population registry. Such ceremonies are held by rabbis of the liberal denominations, by "Havaya," and by others, by celebrities and dear ones standing under the canopy. Couples who marry outside the auspices of the Rabbinate enjoy personalized and meaningful ceremonies that reflect Israel's Jewishness, as well as their and their families preferences. These couples are married as far as they themselves are concerned, according to their families and friends, and their communities. In legal terms, they are "cohabitating." This is what couples do to circumvent the Rabbinate. They conduct ceremonies according to their faiths and worldviews, and avoid having anything to do with the monopolistic Chief Rabbinate and marriage registration. The common-law marriage status in Israel is the most advanced in the Western world, and the difference between this and marriage through the Rabbinate is merely bureaucratic, basically negligible. In Israel, the hundreds of thousands of common-law couples are entitled to the same rights and privileges conferred upon married couples. Couples who marry outside the auspices of the Rabbinate enjoy personalized and meaningful ceremonies that reflect Israel's Jewishness, as well as their and their families preferences - and save themselves the anticipated legal risks associated with divorce via the Rabbinate, if, God forbid, they separate. Further, they play their parts in the societal struggle against the monopoly of Israel's Chief Rabbinate over Jewish marriage and divorce (and other personal matters), and thus promote the righteous call for the establishment of civil marriage in Israel. The heart of "Havaya's" activities is in the realm of wedding ceremonies. I believe that under the wedding canopy is reflected the idea of "the private is public, and the public is political," for a wedding ceremony is a private event, which is conducted in the public sphere and in the State of Israel. Thus it has political significance - it represents the rejection of government established and government empowered religious coercion. Legal wedding ceremonies in Israel (via the Orthodox Rabbinate) create a cultural and legal inequality between husband and wife, validate the lower social status of women, and this at an event that most consider the highest, most special moment of their lives! Conducting "private" egalitarian ceremonies, not through the Rabbinate, promotes a diverse and pluralistic Jewish culture, and provides a legal solution to the complex failure of official marriage and divorce in Israel. In every ceremony, I see a small revolution, done with great joy and gladness, with the voices of the groom and bride. As more couples join #מהפכהבשמחה, and thus change the facts on the ground, the Rabbinate's monopoly crumbles, and the The Knesset won't have any choice but to deal with this new reality, and legislate civil family laws.